“Compassion, Healing and Transformation” is the theme of Emory’s Tibet Week 2018, to be held March 26-31. This year’s series of events features popular annual activities, including the creation of an intricate sand mandala, as well as new opportunities for learning about aspects of transforming hearts and minds. In addition to daily special events, there will be guided compassion meditations Monday through Friday from 5 p.m. to 6 p.m., open to all and with no previous meditation experience needed. All Tibet Week events are free, open to the public and held in the Carlos Museum’s Ackerman Hall. 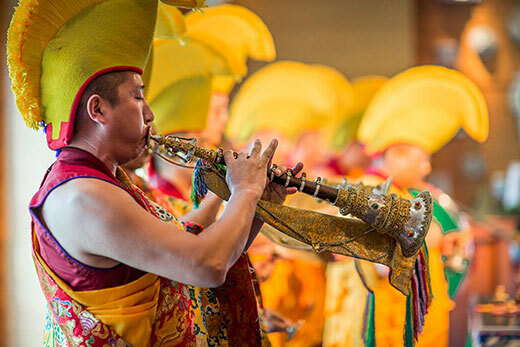 Tibet Week begins with an opening ceremony on Monday, March 26, at 12 p.m., led by Geshe Lobsang Tenzin and the monks of the Drepung Loseling Monastery in Atlanta. At the conclusion of the ceremony, the monks will begin construction of an intricate sand mandala, which will be created during the week and then destroyed at the end to symbolize the impermanence of life. Come to Ackerman Hall any time from 10 a.m. to 5 p.m. Monday through Friday to see the monks at work and the beautiful colors of the sand forming into the mandala. This year’s mandala is in honor of Avalokiteshvara, Buddha of Compassion. More about Avalokiteshvara will be revealed in a talk, “Symbolism of the Avalokiteshvara Mandala,” presented by Lobsang Tenzin Negi, Emory professor of practice in religion, on Thursday, March 29, at 4 p.m. He will explain the complex symbolism captured in the details of the mandala constructed especially for this year’s Tibet Week and how it relates to the theme of compassion, healing and transformation. The professor’s talk is part of the AntiquiTea series at the Carlos Museum, held every month on Thursdays with tea and scones served along with information on an object in the museum’s collection or current exhibition. Prior to Negi’s talk on Thursday, Emory students are invited to join the Drepung Loseling monks from 2 p.m. to 4 p.m. for a hands-on experience with traditional sand painting. Three panel discussions will be held during the week, exploring how Tibetan teachings can influence, and be influenced by, aspects of modern education, scientific learning and health care. The first, “Transforming Hearts and Minds: Social, Emotional and Ethical Learning,” is Monday, March 26, at 7:30 p.m. Negi will moderate this discussion on the value of including these kinds of learning at all levels of education, from kindergarten through university, and how Emory’s SEE Learning program is working to do that. Panelists include Brendan Ozawa-deSilva and Lindy Settevendemie from the Center for Contemplative Science and Compassion-Based Ethics, and Atlanta educators Jennifer Knox from Woodward Academy and Rosalynne Duff from the Kindezi School. “Transformation of the Tibetan Lexicon: Creating a Language for Modern Science” will be Tuesday, March 27, at 7:30 p.m. In this panel, Geshe Lobsang Monlam will discuss the challenges of developing a new scientific lexicon in Tibetan and the role of technology in facilitating this transformation. Monlam is founder of Monlam Tibetan IT Research Center. He will talk with Geshe Dadul Namgyal and Tsondue Samphel, senior interpreters at the Emory- Tibet Science Initiative. The panel will be moderated by Geshe Lhakdor, director of the Library of Tibetan Works and Archives in Dharamsala, India. “Healing Body, Mind and Spirit: Compassion-Centered Spiritual Health Care” on Wednesday, March 28, at 7:30 p.m., discusses how compassion training is informing and shaping the practice of hospital chaplains through a new research-based program. Panelists are Maureen Shelton, chaplain educator; Jennifer Mascaro, biological anthropologist; Charles Raison, psychiatrist; and George Grant, director of spiritual health at Emory Healthcare. Timothy Harrison, associate director of CBCT at the Center for Contemplative Science and Compassion-Based Ethics, will moderate. On Thursday evening at 7:30 p.m., Tibetan filmmaker, writer and environmentalist Dorje Tsering Chenaktsang, known as Jangbu, presents a screening of his film “Kokonor,” a depiction of present day nomadic life around a lake regarded as sacred by Tibetans. Archival image flashbacks also relate the lake’s history. A question-and-answer session will follow the screening. Tibet Week winds up first with Tibetan sand painting for families and then the closing ceremony on Saturday, March 31. Both adults and children can try their hand with Tibetan chak-purs and colored sand to create a sand painting. From 10 a.m. to noon, the sand painting activity is open to Carlos Museum members only; registration is required. From noon to 2 p.m., the sand painting is open to all with registration. The activity is free for Carlos Museum members; $10 for non-member adults, $8 for children ages 6 to 16, free for children 5 and under. Register online. The Tibet Week Closing Ceremonies will be from 2 p.m. to 3:30 p.m., conducted by Geshe Lobsang Tenzin and the monks of Drepung Loseling. In conjunction with Tibet Week, the 10th-annual International Conference on Science Translation into Tibetan will be held March 22-30. Visiting scholars from India, Canada and Australia will join Emory-based translators during the conference. The conference is hosted by the Emory-Tibet Science Initiative Center for Contemplative Science and Compassion-Based Ethics. Tibet Week 2018 is made possible by the Center for Contemplative Science and Compassion-Based Ethics, the Michael C. Carlos Museum, Emory College, the Joni Winston Fund, the Hightower Fund, Drepung Loseling Monastery, Inc., Gaden Phodrang Trust of the Dalai Lama and the Yeshe Khorlo Foundation.